It was a great night for many musicians at the MTV Europe Music Awards, but no one received more recognition than the one and only Biebs. Justin Bieber was the biggest winner at the EMAs in Milan on Oct. 25 — so I'd venture a guess that Beliebers everywhere are beyond ecstatic. He brought home awards for Best Male, Biggest Fans, Best Look, Best North American Act, and Best Collaboration for "Where Are You Now?" with Skrillex and Diplo. Five out of six of his nominations. The variety of these nods represents that voters seriously love everything about Bieber — from his music to his fashion sense. Not only was it an emotional and exciting night for Bieber, but he also made history — he has now won more EMAs than any other artist. 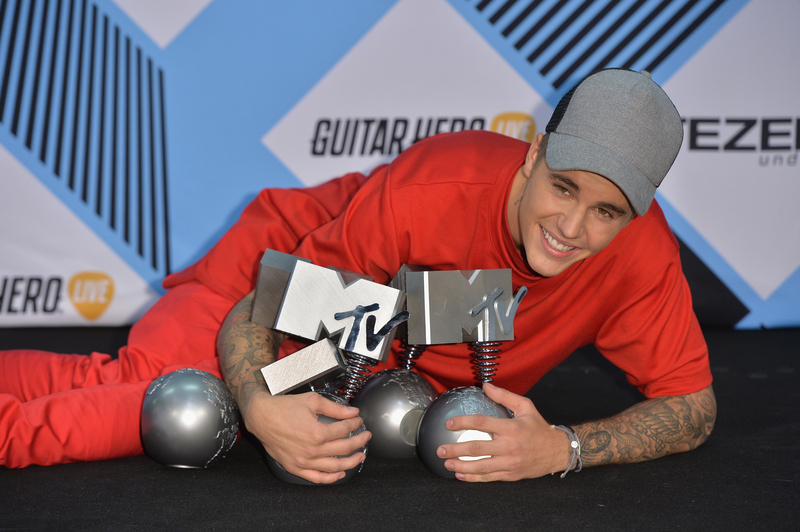 After tonight's victories, Bieber holds a total of 18 awards. The previous record holder was Eminem, who has 15 EMAs. Plus, Bieber's shown a lot of personal growth, as evidenced by his humble speech for his first win of the evening for Best Male. And, when he accepted the Best Collaboration award, he focused on singing the praises of Skrillex and Diplo. The EMA wins come on the heels of a great few months for Bieber — his new single "Sorry" dropped earlier this week with successful results, and his highly anticipated new album Purpose will release on Nov. 13. It's great to see Bieber thriving both professionally and personally after a rough stretch. Growing up in the spotlight can't be easy, and like many young celebs he made his share of mistakes which were immediately broadcast to the entire world. But, all that seems to be behind him now and he can focus on putting his talent to amazing use, and the Beliebers couldn't be happier. Based on his amazing showing at the EMAs, we can rest assured that Purpose will be a tremendous success. It's good to have you back, Justin!